Many differential equations exhibit some form of stiffness, which restricts the step size and hence effectiveness of explicit solution methods. A number of implicit methods have been developed over the years to circumvent this problem. For the same step size, implicit methods can be substantially less efficient than explicit methods, due to the overhead associated with the intrinsic linear algebra. This cost can be offset by the fact that, in certain regions, implicit methods can take substantially larger step sizes. Several attempts have been made to provide user-friendly codes that automatically attempt to detect stiffness at runtime and switch between appropriate methods as necessary. A number of strategies that have been proposed to automatically equip a code with a stiffness detection device are outlined here. Particular attention is given to the problem of estimation of the dominant eigenvalue of a matrix in order to describe how stiffness detection is implemented in NDSolve. Numerical examples illustrate the effectiveness of the strategy. Stiffness is a combination of problem, solution method, initial condition and local error tolerances. Stiffness limits the effectiveness of explicit solution methods due to restrictions on the size of steps that can be taken. Stiffness arises in many practical systems as well as in the numerical solution of partial differential equations by the method of lines. and solve over the interval . Stiffness can often occur in regions that follow rapid transients. The problem is that when the solution is changing rapidly, there is little point using a stiff solver, since local accuracy is the dominant issue. For efficiency, it would be useful if the method could automatically detect regions where local accuracy (and not stability) is important. as a simplified model for studying the initial value problem (1). where and is the (rational) stability function. 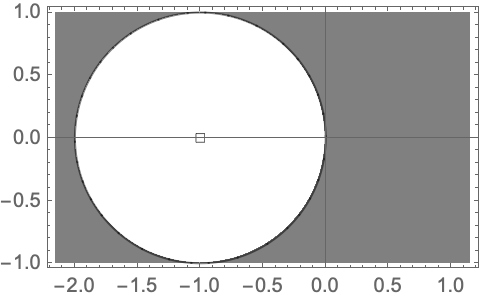 The shaded region represents instability, where Null. The linear stability boundary (LSB) is often taken as the intersection with the negative real axis. For the explicit Euler method . For an eigenvalue of , linear stability requirements mean that the step size needs to satisfy , which is a very mild restriction. However, for an eigenvalue of , linear stability requirements mean that the step size needs to satisfy , which is a very severe restriction. 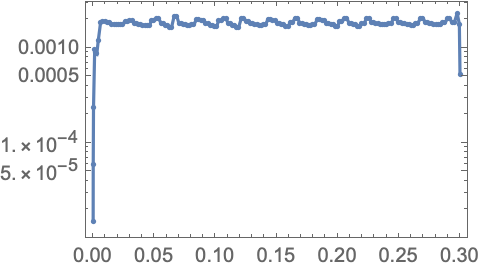 This example shows the effect of stiffness on the step size sequence when using an explicit Runge-Kutta method to solve a stiff system. A large number of step rejections often has a negative impact on performance. The large number of steps taken adversely affects the accuracy of the computed solution. The method is unconditionally stable for the entire left half-plane. This means that to maintain stability there is no longer a restriction on the step size. The drawback is that an implicit system of equations now has to be solved at each integration step. A type-insensitive solver recognizes and responds efficiently to stiffness at each step and so is insensitive to the (possibly changing) type of the problem. One of the most established solvers of this class is LSODA [H83], [P83]. Later generations of LSODA such as CVODE no longer incorporate a stiffness detection device. The reason is because LSODA uses norm bounds to estimate the dominant eigenvalue and these bounds, as will be seen later, can be quite inaccurate. The low order of A(α)-stable BDF methods means that LSODA and CVODE are not very suitable for solving systems with high accuracy or systems where the dominant eigenvalue has a large imaginary part. Alternative methods, such as those based on extrapolation of linearly implicit schemes, do not suffer from these issues. Much of the work on stiffness detection was carried out in the 1980s and 1990s using standalone FORTRAN codes. New linear algebra techniques and efficient software have since become available and these are readily accessible in the Wolfram Language. Stiffness can be a transient phenomenon, so detecting nonstiffness is equally important [S77], [B90]. There are several approaches that can be used to switch from a nonstiff to a stiff solver. A convenient way of detecting stiffness is to directly estimate the dominant eigenvalue of the Jacobian of the problem (see [S77], [P83], [S83], [S84a], [S84c], [R87] and [HW96]). Such an estimate is often available as a by-product of the numerical integration and so it is reasonably inexpensive. Richardson's extrapolation provides a sequence of refinements that yields a quantity of this form, as do certain explicit Runge–Kutta methods. Cost is at most two function evaluations, but often at least one of these is available as a by-product of the numerical integration, so it is reasonably inexpensive. Let denote the linear stability boundary—the intersection of the linear stability region with the negative real axis. where is a safety factor. The methods "DoubleStep", "Extrapolation", and "ExplicitRungeKutta" have the option "StiffnessTest", which can be used to identify whether the method applied with the specified AccuracyGoal and PrecisionGoal tolerances to a given problem is stiff. The method option "StiffnessTest" itself accepts a number of options that implement a weak form of (5) where the test is allowed to fail a specified number of times. The reason for this is that some problems can be only mildly stiff in a certain region and an explicit integration method may still be efficient. The "StiffnessSwitching" method has the option "NonstiffTest", which is used to switch back from a stiff method to a nonstiff method. An approach that is independent of the stiff method is used. Many linear algebra techniques focus on solving a single problem to high accuracy. For stiffness detection, a succession of problems with solutions to one or two digits is adequate. The spectra of the succession of matrices often change very slowly from step to step. Costs less than the work carried out in the linear algebra at each step in the stiff solver. Takes account of the step-to-step nature of the solver. A simple and efficient technique of obtaining a bound on the dominant eigenvalue is to use the norm of the Jacobian Null where typically or . The method has complexity , which is less than the work carried out in the stiff solver. This is the approach used by LSODA. 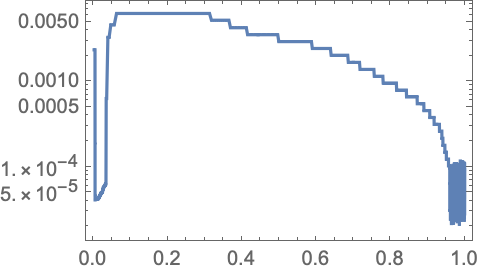 Norm bounds for dense matrices overestimate and the bounds become worse as the dimension increases. 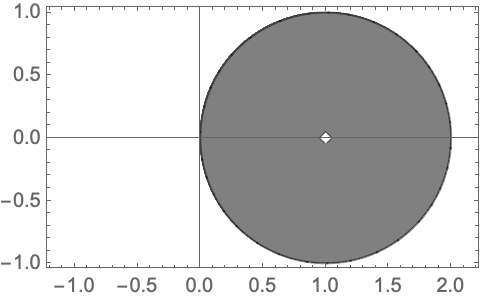 Norm bounds can be tight for sparse or banded matrices of quite large dimension. The setting "NormBound" of the option "NonstiffTest" computes Null and Null and returns the smaller of the two values. For small problems ( ) it can be efficient just to compute the dominant eigenvalue directly. The setting "Direct" of the option "NonstiffTest" computes the dominant eigenvalue of using the same LAPACK routines as Eigenvalues. For larger problems the cost of direct eigenvalue computation is , which becomes prohibitive when compared to the cost of the linear algebra work in a stiff solver. A number of iterative schemes have been implemented for this purpose. These effectively work by approximating the dominant eigenspace in a smaller subspace and using dense eigenvalue methods for the smaller problem. Shampine has proposed the use of the power method for estimating the dominant eigenvalue of the Jacobian [S91]. The power method is perhaps not a very well-respected method, but has received a resurgence of interest due to its use in Google's page ranking. 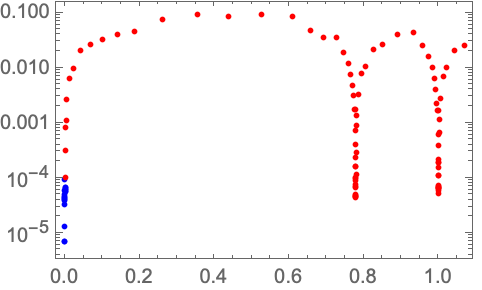 has linearly independent eigenvectors (diagonalizable). The eigenvalues can be ordered in magnitude as . is the dominant eigenvalue of . In particular, the method does not converge when applied to a matrix with a dominant complex conjugate pair of eigenvalues. The power method can be adapted to overcome the issue of equimodular eigenvalues (e.g. NAPACK). However the modification does not generally address the issue of the slow rate of convergence for clustered eigenvalues. Although the methods work quite differently, there are a number of core components that can be shared and optimized. Subspace and Krylov iteration cost operations. They project an  matrix to an  matrix, where . The small matrix represents the dominant eigenspace and approximation uses dense eigenvalue routines. Subspace (or simultaneous) iteration generalizes the ideas in the power method by acting on vectors at each step. The orthonormalization step is expensive compared to the matrix product. The matrix has small dimension  . Note that the Schur decomposition can be computed in real arithmetic when using a quasi upper triangular matrix . Therefore it can be beneficial to take, for example, or more even if we are only interested in the dominant eigenvalue. This is not sufficient since it can be satisfied when convergence is slow. If or then the column of is not uniquely determined. where , is the column of , and is the column of . This is advantageous since it works for equimodular eigenvalues. The first column position of the upper triangular matrix is tested because of the use of an ordered Schur decomposition. There are several implementations of subspace iteration. "An attractive feature of SRRIT is that it displays monotonic consistency, that is, as the convergence tolerance decreases so does the size of the computed residuals" [LS96]. 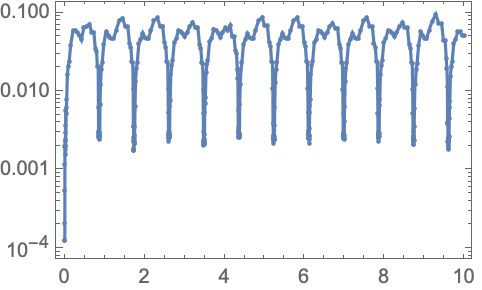 SRRIT makes use of an ordered Schur decomposition where eigenvalues of the largest modulus appear in the upper-left entries. Modified Gram–Schmidt with reorthonormalization is used to form , which is faster than Householder transformations. The Rayleigh–Ritz procedure consists of computing and solving the associated eigenproblem . The approximate eigenpairs of the original problem , satisfy and , which are called Ritz values and Ritz vectors. The process works best when the subspace approximates an invariant subspace of . The method of Arnoldi is a Krylov-based projection algorithm that computes an orthogonal basis of the Krylov subspace and produces a projected  matrix with . Input: matrix , the number of steps , an initial vector of norm 1. In the case of Arnoldi, has an unreduced upper Hessenberg form (upper triangular with an additional nonzero subdiagonal). Orthogonalization is usually carried out by means of a Gram–Schmidt procedure. 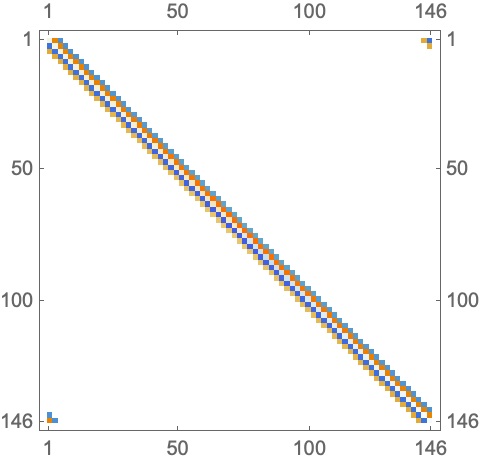 The Ritz pairs converge quickly if the initial vector is rich in the direction of the desired eigenvalues. When this is not the case then a restarting strategy is required in order to avoid excessive growth in both work and memory. Explicit restart—a new starting vector is a linear combination of a subset of the Ritz vectors. Implicit restart—a new starting vector is formed from the Arnoldi process combined with an implicitly shifted QR algorithm. Explicit restart is relatively simple to implement, but implicit restart is more efficient since it retains the relevant eigeninformation of the larger problem. However implicit restart is difficult to implement in a numerically stable way. An alternative that is much simpler to implement, but achieves the same effect as implicit restart, is a Krylov–Schur method [S01]. 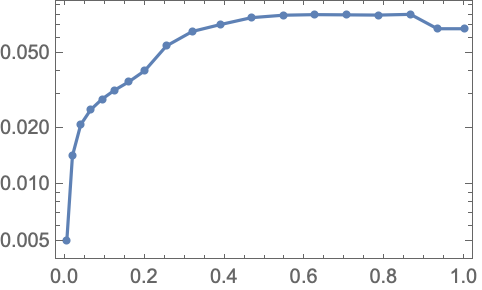 The implementation in "NonstiffTest" is based on Krylov–Schur iteration. The "Automatic" setting uses an amalgamation of the methods as follows. For direct eigenvalue computation is used. Either or is used, depending on which method is active. For subspace iteration is used with a default basis size of . If the method succeeds then the resulting basis is used to start the method at the next integration step. If subspace iteration fails to converge after iterations then the dominant vector is used to start the Krylov method with a default basis size of . Subsequent integration steps use the Krylov method, starting with the resulting vector from the previous step. If Krylov iteration fails to converge after iterations, then norm bounds are used for the current step. The next integration step will continue to try to use Krylov iteration. 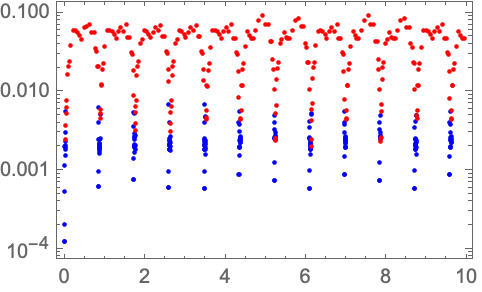 Since they are so inexpensive, norm bounds are always computed when subspace or Krylov iteration is used and the smaller of the absolute values is used. Caching of the time of evaluation ensures that the dominant eigenvalue estimate is not recomputed for rejected steps. 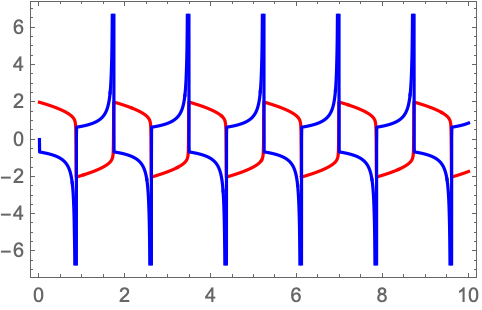 Step rejections often occur for nonstiff solvers when working near the stability boundary. Step rejections often occur for stiff solvers when resolving fast transients. The default tolerance aims for just one correct digit, but often obtains substantially more accurate values—especially after a few successful iterations at successive steps. If these values are set too large then a convergence failure becomes too costly. In difficult problems, it is better to share the work of convergence across steps. Since the methods effectively refine the basis vectors from the previous step, there is a reasonable chance of convergence in subsequent steps. It is important to incorporate some form of latency in order to avoid a cycle where the "StiffnessSwitching" method continually tries to switch between stiff and nonstiff methods. The options "MaxRepetitions" and "SafetyFactor" of "StiffnessTest" and "NonstiffTest" are used for this purpose. The default settings allow switching to be quite reactive, which is appropriate for one-step integration methods. "StiffnessTest" is carried out at the end of a step with a nonstiff method. When either value of the option "MaxRepetitions" is reached, a step rejection occurs and the step is recomputed with a stiff method. "NonstiffTest" is preemptive. It is performed before a step is taken with a stiff solve using the Jacobian matrix from the previous step. For such a small system, direct eigenvalue computation is used. The example serves as a good test that the overall stiffness switching framework is behaving as expected. Discretization of the diffusion terms using the method of lines is used to obtain a system of ODEs of dimension . Unlike the Van der Pol system, because of the size of the problem, iterative methods are used for eigenvalue estimation. A switch to a stiff method occurs near and the first test for nonstiffness occurs at the next step . Norm bounds are quite sharp in this example. 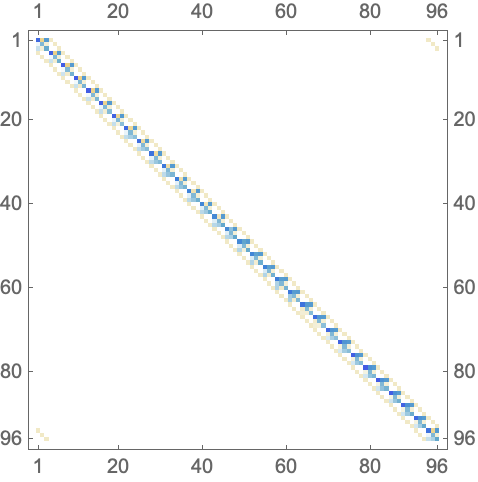 Discretization using the method of lines is used to form a system of 192 ODEs. The extrapolation methods never switch back to a nonstiff solver once the stiff solver is chosen at the beginning of the integration. Therefore this is a form of worst case example for the nonstiff detection. Despite this, the cost of using subspace iteration is only a few percent of the total integration time. Norm bounds overestimate slightly, but more importantly they give no indication of the relative size of real and imaginary parts. Options of the method option "StiffnessTest". Options of the method option "NonstiffTest".